Since I have to send a bouquet tomorrow, I clipped a few clusters of what we call my Mother's Day rose. The sprawling, scrubby bush was the only plant in our original fixer-upper's yard, but we were too busy sanding floors to dig it up. Imagine my surprise on our first Mother's Day, when it burst into clusters of snowy white blossoms. That was such a special spring. When it came time to move on, I took a few clippings to the next home. They struggled to adjust--but a year later I dug a tiny branch for the new house. Neither my husband nor I look forward to pruning the mammoth shrub that little slip has become. Its tiny sharp thorns will cut through gloves with the fierceness of a protective mother. Its adaptability, its abundant growth, its ability to thrive just about anywhere--all aspects of motherhood I hope to cultivate in my own life. Wouldn't it be nice to pass along a cutting of this rose for my grandchildren's gardens? How do you take cuttings and grow new bushes from them? I tried one time, and nothing happened. Any tips? This rental house we're living in right now has a wonderfully huge rosebush in the back, and I'd love to take a cutting or two with me when we move. Help! Lovely! I wrote a very similar post this weekend---my children gave me a rose bush a few years ago for Mother's Day and in time it has become a huge, gorgeous plant! Oh, they're beautiful! And I agree--what a nice thing to pass on to your grandchildren. You are very talented to be able to make such gorgeous arrangements. How gorgeous! And what a wonderful surprise that it bloomed on Mother's Day. Thanks! Yes, Ruth, the title comes from Proverbs 31. As I read through the passage over a year ago, I realized that my greatest homemaking talent is the ability to find things of quality in all kinds of places...hence Like Merchant Ships! Melody, this particular old-fashioned rose is so prolific, it plants itself. Anywhere a branch comes in contact with the ground, it sends out little rootlets that eventually develop into individual plants. Taking a slip only involves about a million scratches as you wrestle a rooted branch from the mother plant. 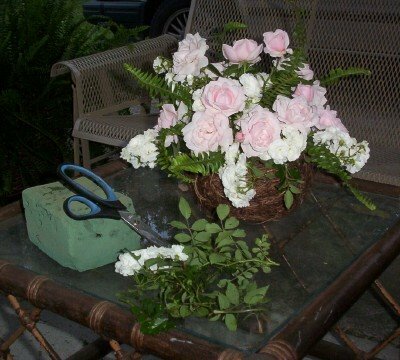 You can take cuttings from almost any rosebush, though. I have done this twice by clipping a small section, deheading the blossom, and dipping the end into a rooting hormone before transferring to a moist potting soil container. I think the rooting hormone is key. I read about someone who did this with all 12 stems of her sister's bridal bouquet--and presented her with 12 rosebushes a year later. How cool is that?